If you read the previous blog post, you will realise I am slightly remorseful at the reduction in blog posts since I started using Twitter and am attempting to quickly catch up ready to post more often in future. Here is a catchup post for November. By the start of November, I had noticed the effect of Twitter on my written output, although I suspect the absence of blog posts had more to do with my broken 3G card meaning I could easily tweet (from my phone) but less easily blog while on the go. I kicked off the month with a trip to the LSE. LSE is a strange place in some ways – I am not used to meeting undergraduate mathematicians with a clear sense of direction but students at LSE are taking economics-facing aspects of mathematics and seemed to be very clear on their future plans. 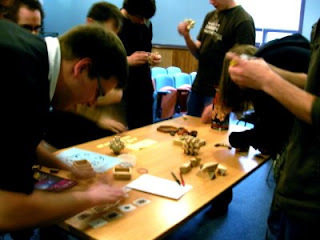 I was glad, then, that the student society chose to invite me to give my puzzles, rather than careers, talk. Later that week I made a trip to Kent. When I got to the university there had been a mix-up and no one arrived to meet me. To make a 7 hour round trip and give no talks would be a disaster! Luckily I had been copied into an email where the students were invited to the talk, so I knew where it was supposed to be. Armed with a campus map I found the room, and it filled with students, so I was able to give my talk. The following week I took a trip to the North East. 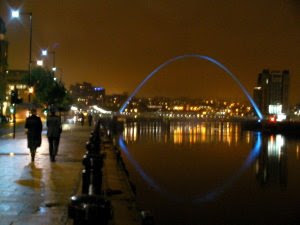 I started with my puzzles talk at Newcastle, followed by dinner and the pub with the every-welcoming Newcastle Mathsoc. 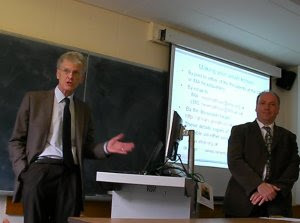 The following day I was welcomed and my careers talk went well at Durham at lunchtime, as did my Spin in ball games/Wii talk in the evening at York. The students at York had Mathsoc hoodies with the slogan: “Mathsoc: the only society that counts”. A taxi driver in York asked me where I had come from. I said I started the day in Newcastle, was in Durham at lunchtime, York in the evening and returning to Newcastle for the night. “Wow,” he said, “you’re clocking up some miles there!” I didn’t tell him I had come from Nottingham the previous day and would return there tomorrow! The following morning I gave my puzzles talk to a large audience at Northumbria at Newcastle and it went well, then I returned to Nottingham. On my way home I did a quick tally – 205 students at 4 unis had heard me lecture in the previous 48 hours. Finally that week I went to Birmingham and spoke at the 11th Younger Mathematicians Conference, on my work with the IMA. Although I couldn’t make the whole day, I did catch the talk before mine which was introduced by the conference Chair as an “exciting sounding talk” on sperm biophysics! The following week found me on a trip to Sheffield. I gave my careers talk to the student society at lunchtime and this went well, but it was the evening talk that was making me nervous. In the evening I was to give my talk on cryptography to students and local IMA members, in an attempt to kindle interest in a South Yorkshire Branch. This coincided with a student pub crawl and a local branch RSS talk in the department, so we were worried about attendance. Anyway, a good number of students and local members turned up and the talk was well received. I met a number of people who were involved in an IMA Branch in that area in the late 1970s. One chap came into the room and commented “It’s been a while since we’ve had one of these (an IMA Branch talk)”. I didn’t like to point out they haven’t held one while I’ve been alive – and I was giving it! The following week saw me off to Scotland. I got on a train first thing and 6 hours later got off one in Dundee and within an hour I was giving a talk. I had planned to give my careers talk but was asked if I would mind giving a hybrid careers & puzzles talk. Tired and last minute though it was, I managed this. By the end of the day I had travelled around 400 miles and had set up camp in Edinburgh. 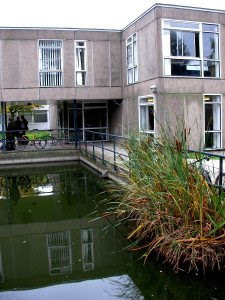 The following day I travelled to Aberdeen and gave my cryptography talk to the Maths Club. By this time I had written my History of maths and x on substitution ciphers ready for 1 December and as a result had rewritten the first half of my cryptography lecture to take into account what I had learned. 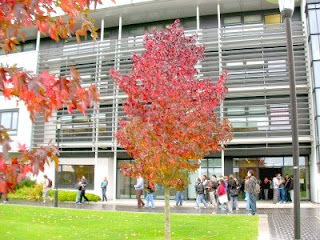 On the Wednesday, I travelled to Stirling first and gave my careers talk, then on to Glasgow. Glasgow was very wet and windy. I had a difficult time at Strathclyde: my talk was in a different building to the maths department and the chap who was to meet me was held up. Once I found the room and started late, my careers talk was interrupted by a fire alarm. As I had already given the talk once that day, I had a little trouble remembering what I had and hadn’t said when we resumed! By the time I gave my third careers talk of the day, at Glasgow, I felt I had really hit my stride. Maybe it was the wine they’d had before the talk but the MacSoc audience laughed, gasped and looked thoughtful when I thought they would. On Thursday I went to St. Andrews and gave my cryptography talk to the Chaosoc, which went well. I realised that this audience was the one with the 1000th student to have heard me speak this academic year. In the evening I returned to Edinburgh to give an evening lecture at Edinburgh on puzzles. This was well received by staff and students and followed by a wine reception. I was impressed at the level of staff/student engagement. Finally, last but not least, on Friday I gave a morning lecture on cryptography, the third this week, to the newly formed society at Heriot-Watt. In the audience at Heriot-Watt was visiting Professor Jerzy Jaworski, who usually works in cryptography at Adam Mickiewicz University, the institution (formerly known as Poznań University) from which the Polish Cipher Bureau recruited Marian Rejewski, Henryk Zygalski, and Jerzy Różycki, the cryptanalysts who made the initial breakthroughs on cracking the Enigma machine (and whose efforts I mention in my talk). Boy, I’m glad I didn’t know that before I gave the talk! Anyway, he was very nice about my talk and said he had given hundreds of talks covering the same topics in an outreach role at his institution. The trip to Scotland was fairly epic and I was very pleased to be able to visit all 8 universities that are on my list of Scottish universities offering mathematics. I have very much enjoyed both my trips to Scotland. At one of the talks I explained my job with the IMA was engaging with university mathematics students and someone asked me, incredulous, “do you do this job for the whole of…” I was already nodding enthusiastically, “…of Scotland?” Ah. Yes, I replied, this week I do. In November I was questioned quite regularly over cups of tea and lunches by university staff on the future of the LMS, e-assessment, research funding and the Impact agenda. Quite a heady mix! Anyway, this brings us to the end of November and I will leave December to another post. At the end of April I made a trip to Newcastle and back via Sheffield to give my talk on Spin in Ball Games and play on the Wii. Both of these events were fun and I think provided some welcome revision relief for the students. At this time of year a lot of universities have ceased all but revision lectures and the appetite I found for careers talks in February is much reduced by now. Both of these talks were organised by the student societies and I think it is useful for me to have in my repertoire more fun events to engage with students in these situations. Below are the posters used to advertise my presence in the two universities (click to enlarge). Apart from the completely made up title and abstract at Sheffield (my fault for not sending the real one), I think it is interesting to note the differences in approach taken. At Sheffield, an attempt is made to make the talk appear like a serious mathematical lecture on the physics of spin in ball games and how these are modelled in video games, using ‘examples’ on the Wii. On the other hand Newcastle make no bones about it, using a large photo of a Wii on the poster! In reality, the Newcastle interpretation is closer to reality; this is intended to be a fun night out of tenuous mathematical relevance in which the students have a laugh and go home a little more aware of the existence of the IMA. The ‘serious’ talk at Sheffield had to pause at one point when one of the players had a call from his girlfriend who, with the noise of the Wii in the background, would simply not believe he was at a maths event. “No really, it’s a serious maths lecture from the IMA” he said, with Mario Power Tennis sound effects in the background.